Bucolic Bushwick: Sunscald, Ahhh It Burns! After returning from a lovely visit to my family in Chicago I came back to this. Sweet peppers rotting from the outside, but only 2 or 3 and only on one plant. I thought it was some bug or something slowly eating away at the skin, but after some research I discovered it was sunscald. Yes, vegetables can get sunburn. These peppers were the only ones affected because they were the only ones not shaded by leaves. The affected areas had a dry, papery texture and the fruit as a whole felt soft/borderline mushy. I just snipped them off. 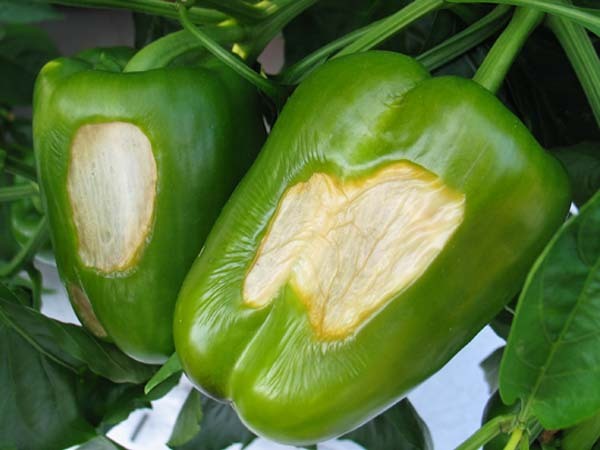 I had this same issue with my bell peppers last summer and until I found your photo's, it never struck me as to why the odd spots. For my tomatoes I use a type of powdered clay that when mixed with water and sprayed on tomatoe fruits, it protects them from sunburn. Guess I'll be doing the same thing for me bell peppers and as well, maybe I'll look into companion planting for my bell peppers, a more natural way to shield them from the sun.